This work, written by a Viennese Jew, is about the Jews of Vienna after the ANSCHLUSS and through the Holocaust and its aftermath. Although it has a pronounced exculpatory bias in its treatment of Jews who served the Nazis, it also contains some seldom-told information. For instance, in the latter stages of the deportations (to the death camps), many Jews committed suicide, but suicides were rare among Orthodox Jews. (p. 147). The SONDERDIENST (or ‘Jupo’ for ‘Jewish police”) consisted of Jews who eventually served the Gestapo. 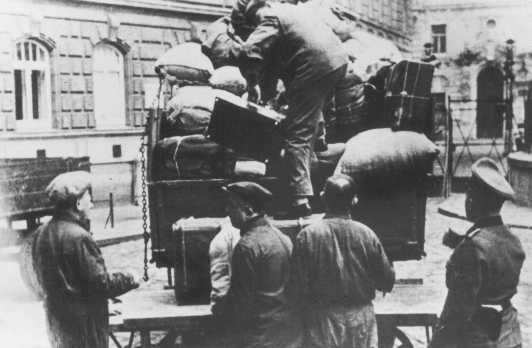 In return for exemption from deportation, these Viennese Jewish individuals, also freed from the obligation of wearing the Star, were sent to uncover those Jews that had attempting to escape deportation by hiding. (p. 131). The author quotes Willy Stern, whom the German authorities tried but failed to recruit as an informer. The German official kept bringing up the van that takes prisoners away, and kept asking Stern if he would reconsider his refusal. Oddly enough, despite Stern’s persistent refusals to turn informer, the German official let him go. (p. 79). The foregoing must be put in broader context. The Germans recruited informers among Poles in a very similar manner–by offering them some privilege or reward (e. g, money), or sparing them a worse fate (e. g, being sent to a concentration camp) in return for collaboration. The following information corroborates Polish sources that point out that, not only did Jewish Gestapo agents inform on fellow Jews, but they also informed on Poles. Moreover, it shows that the anti-Polish work of Jewish Nazi collaborators was performed not only by Polish Jews, but also by non-Polish Jews (in this case, an Austrian Jew). Thus, author Rabinovici writes, “Apart from the SONDERDIENST, there were also Jewish Gestapo informers. Rudolf Klinger, for example, was able to uncover Jewish ‘submarines’ [Jews living incognito] even when they were well hidden. He also infiltrated the Polish underground movement and an anti-Fascist group formed by Baron von Lieben, Baron Karl Mostesicky and the doctor Ella Lingens. According to Lingens, he set a trap for the group and had the Jews and non-Jews who helped them sent to Auschwitz.” (p. 131). WHEN DID THE VIENNESE JEWS “KNOW” THAT JEWS, AS A WHOLE, WERE TARGETED FOR EXTERMINATION? Rabinovici asks, “What does it mean to ‘know’ about a crime? A long time can pass from the first rumours of an atrocity to the day on which these rumours turn into a certainty.” (p. 149). The earlier cruelties of the Nazis, freely experienced by the Jews, did not, in and of themselves, translate into Jewish awareness of Nazi exterminatory intentions, and still less Jewish recognition of the Nazi actualization of the same. Rabinovici comprehends this fact as he comments, “At the time, however, people could not imagine it because they didn’t believe that anyone, EVEN THE NAZIS, were capable of such atrocities…” (p. 154: Emphasis added). Now, having a vague sense of unease in boarding a train is NOT the same as having awareness that boarding a train means likely death. Rabinovici comments, “No one willingly joined the transports, but no one could or wanted to imagine what was happening in the extermination camps.” (p. 154). Once they fully realized that they were targeted for death, some Jews opted for collaboration with the Nazis in a desperate attempt to avoid being dispatched to the extermination camps. This is the standard exculpation for Jewish-Nazi collaboration. However, as we have seen, this exculpation was not even potentially valid until the LATTER stages of the existence of the Third Reich. As if trying to reinforce this fact, the author writes, “Even the future murderers did not know in 1933 or 1939 that millions of Jews would be murdered in the next few years.” (p. 13). The Austrian Jewish realization of the systematic Nazi killing of Jews did not become reality until 1943 and 1944. (p. 155). Until then, the Viennese Jews did NOT think that they were in a position in which their own lives were in imminent danger, and still less that only collaboration could potentially save their lives. Note that this should not be confused with the GENERAL situation—true in virtually every war since time began—wherein collaboration with the enemy commonly improves one’s lot and commonly improves one’s chances of surviving enemy rule. That is what held for the Austrian Jews under the Nazis, and collaborating with them, until at least 1943 and 1944, and was no different from the situation facing other peoples under brutal enemy rule. Rabinovici summarily excuses the conduct of the Vienna JUDENRAT. He repeats all the canned exculpatory memes: Jewish powerlessness (p. 3, 8, 12, 198, 202), the desire to make a bad situation less bad (p. 12, 201), and the desire to be in a better position to negotiate better terms, with the enemy, for one’s people. (p. 7, 200, 202). The hollowness of these canned exculpations is demonstrated by the fact that they are all-purpose: They can be invoked by virtually any collaborator. Consider Vidkun Quisling, whose very name has become synonymous with Nazi collaboration. In his (unsuccessful) defense, he argued that his collaboration made Nazi German rule over Norway less severe than would have been the case had he not collaborated. He could also have cited the powerlessness of the Norwegian people because, after all, they had been conquered by the Third Reich and were completely at Germany’s mercy. Finally, he could have argued that, by virtue of being a high-level collaborator, he had thereby placed himself in a position to negotiate better terms for the Norwegian people under Nazi German rule. The cornerstone argument for Holocaust exceptionalism is the one about the Nazis performing the complete extermination of the Jews—moreover with an unprecedented fanaticism that brushed aside any obstacles or potentially-conflicting interests. This was far from the case. Rabinovici (pp. 109) describes the September 1941 compulsory wearing of the Star by Viennese Jews. He notes that, “Foreign Jews were exempt from the regulation; the German Reich had to allow for international and diplomatic interest.” (p. 111). Clearly, then, the Nazi conduct towards the Jews was pragmatic, not mystical or fanatic. Genocidal objectives were tempered to reality, just as in the case with all non-Jewish genocides. The Shoah was thus no different from any other genocide. We sometimes hear that there was no “Wannsee Conference” to decide the fate of the Gypsies, Poles, or others—as if the Nazis actually needed a formal conference before they could proceed with the full-blown genocide of a group. There is a further irony to this Holocaust supremacist talking point. Author Rabinovici realizes that the Wannsee Conference did not decide the extermination of the Jews. The Nazi German decision had actually been made some months earlier (p. 103), evidently without any conference. Contrary to the notion that the Holocaust was exceptional because it was irrational (insofar as it brought no tangible—read material–benefit to the perpetrator), Rabinovici comments, “The dismissals, exploitation and expropriation of the Vienna Jews had begun in March 1938; the economic destruction was therefore undertaken by the Nazi authorities LONG BEFORE the physical extermination. The Jews were plundered and exploited through forced labour. Their homes were taken from them and they received limited food rations.” (p. 113; Emphasis added).